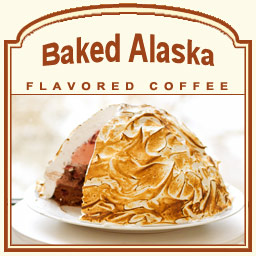 Baked Alaska flavored coffee features a decadent white chocolate mousse, a rich Double-Dutch chocolate, and a wild raspberry conglomeration of flavors. This dessert is generally served with creamy, cold ice cream covered in a hot, fluffy meringue topping, but without baking it � you can now indulge in this Baked Alaska flavored coffee. Made with 100% real Arabica beans, this dessert-flavored coffee will have your taste buds craving more and more. A heat-sealed valve bag will ensure the freshest coffee � which will be fresh roasted and shipped on the same day. Go ahead and enjoy this flavored coffee without any worries � there are only 2 calories per cup of this Baked Alaska! Mmm � delish!